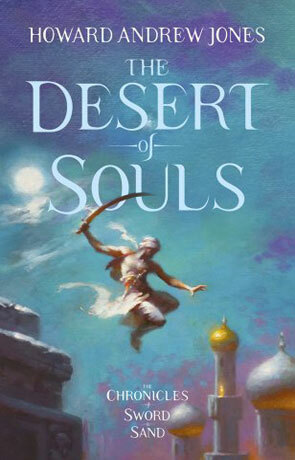 The Desert of Souls is a sweeping tale that is firmly rooted in the traditional sword and sorcery genre and yet flows with a steady, refreshing grace. Set in 8th Century Baghdad the novel is full of an eastern style that sets it apart from the majority of the genre. It's a refreshing environment and the author really does manage to it justice, never taking things too seriously and rendered with an earthy, low fantasy quality. The only recent novel that comes close is the equally impressive Throne of the cresent moon by Saladin Ahmed. The story follows the vizier's captain Asim and his scholar friend Dabir who are sent after a stolen tablet that holds the potential of a hidden promise and dark, dangerous secrets. Asim and Dabir are set on a chase that will take them across the middle east and into a struggle between life and death with the promise of power to unlock the secrets within the fabled lost city of Ubar. There is a lot to like about this book, it's such a well crafted tale and the characters are brought to life in the most engaging manner while the plot holds more twists and turns than politicians manifesto. Then as mentioned above there is the setting, a rich middle-eastern world that feels ever so fresh and different to the western "dark ages" fantasy land that is still over-used by so many authors - I am so glad that we are finally getting free from that tired setting. The quality of the prose is outstanding, ever so easy to read and yet full of colourful descriptions, high adventure and and addictive quality that has you glued to the book. Asim, Dabir and Sabirah make a very rewarding group of adventurers and the interplay between Asim and Dabir is one of the highlights of the novel, a friendship that appears as genuine as the characters themselves. I love the way the author manages to create a very earthy, solid quality that grounds the novel and gives it an air of realism and yet still manages to fill this with magic and dark other-worldy powers. The Desert of Souls is a tale from a true storyteller - of which there are very few, an engaging, magical journey to distant times and rich places, highly recommended. Written on 14th June 2013 by Ant.